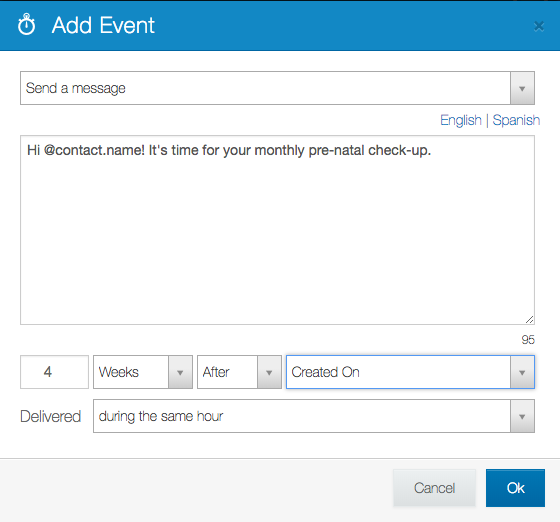 Use campaign events to send messages or workflows to groups based on a specific date. A campaign event represents an action that is performed at a time relative to a date-time contact field, such as "Created On", which is the date a contact was created. Be sure to first Create a Campaign to which you can then add an Event! 1. Navigate to the campaigns tab, then click the campaign to which you'd like to add an event. 2. Click on the "Add Event" box in the upper right corner. 3. Select the action you'd like to assign to the event (either Send a Message or Start a Flow). Number of minutes, hours, days, weeks. Before or after the contact field selected. The contact field selected. The default contact field is "Created On", which refers to the date a contact was created. The time at which the event will deliver on the date relative to the contact field selected. You may want to create events based around a custom date for your contacts. For example, you may want to send a reminder in relation to pregnant woman's expected delivery date. Learn to create your own custom date field here.